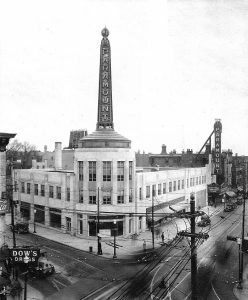 Paramount Theater in Walnut Hills, where City Temple met in the 1940’s. In 1949 our church merged with a group known as the City Temple. Prior to the merger, a district officer of the Universalist Church asked the City Temple pastor to describe his church. This is the response from Dr. Harry Grannison Hill which was passed on to our own Board of Trustees. I have learned from one of the members of my Board that you would like to have a little history of the City Temple. Perhaps I can best approach the subject by giving you a little of my own background. I graduated from Bethany College in West Virginia and was ordained to the Christian Church ministry in 1897. After serving as pastor for Christian Churches in Hebron, Indiana, Cincinnati, and Omaha, Nebraska, I went to Indianapolis and soon found that I was becoming too liberal for their creed. I was never completely away from religious activity as I organized and became leader of the Peoples Church of Indianapolis in addition to Chautauqua lecturing and managing and being President of Indiana College of Music and Fine Arts. While leading a Truth group in Indianapolis, I was called to be pastor of the New Thought Temple of Cincinnati and when I left there in 1943, I organized and became pastor of the City Temple. Now I am 75 and have had over 52 years in the ministry and find that my health dictates my retirement. Consequently, my people are seeking new leadership. We have been holding our services in the Paramount Theatre and when we learned that the First Universalist Church of Walnut Hills was without a pastor and that their membership had become somewhat smaller the last year or so, we felt that a merger might benefit both groups. As the enclosed constitution indicates, we are a non-denominational group. We have no creed but the brotherhood of man as expressed in the example and teachings of our elder brother, Jesus the Christ. We believe God is all powerful and is the One to be worshiped as the Supreme Spirit. We believe that every man has within himself the spark of divinity which causes him to aspire to all that is good, true and beautiful. We have been supported solely by the voluntary love offerings of our people and have never had any money-making affairs and have never dunned people for contributions. The City Temple has never been in debt and has always had more than enough to meet all expenses. I have known many Universalist ministers well and have held services in Universalist Churches here and in Illinois and am rather familiar with the teachings which I find very acceptable. The recent pastor of the First Universalist Church was a co-member of a liberal ministers group here in Cincinnati. If there is further information that I can give, I shall be most happy to answer any question you might wish to ask. Dr. Hill’s health prevented him from much activism in the merged churches and in February 1951, Dr. Hill passed away and was buried in Spring Grove Cemetery.